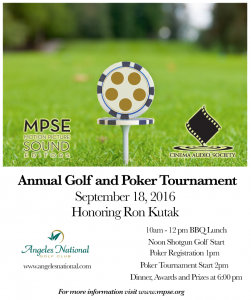 Los Angeles, August 2016 – The Cinema Audio Society (CAS) has announced that it will co-sponsor with the Motion Picture Sound Editors the 8th Annual MPSE Golf and Poker Tournament, September 18, 2016 at the Angeles National Golf Club in Sunland, California. Proceeds from the event benefit the MPSE’s Ethel Crutcher Scholarship Fund, which provides mentoring and support for student sound artists, as well as the organization’s work in promoting the role of sound in movies, television, gaming and other entertainment media. This year marks the first time that the Cinema Audio Society has joined the MPSE in sponsoring the event. Serving as Honorary Chairman will be Ron Kutak, the longtime National Executive Director of IATSE Editors Guild Local 700, who is retiring from his post November 1.